Martha Beck's work as a life coach has been featured on Oprah and has earned her accolades in outlets from National Public Radio to USA Today. More important, her trademark wisdom, empathy, and humor have changed thousands of lives, helping people who felt disconnected from their true sense of purpose to locate meaning in their lives and change. 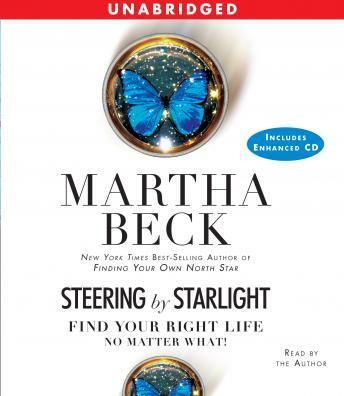 Now, in the tradition of her bestseller Finding Your Own North Star, Martha Beck reconnects listeners with their authentic hopes, needs, and desires in Steering by Starlight. Beck brings together cutting-edge research in psychiatry and neurology, practical exercises and the step-by-step process she uses with her private clients to offer powerful new methods for solving problems that beset every one of us. Whether you're seeking better relationships, more focused career direction, specific fitness goals, or a more harmonious lifestyle, Steering by Starlight's colorful and touching anecdotes, case studies and exercises will give you the tools you need to become your own guide and point the way to an authentic, rewarding life.